You saw the first one, here’s another one! Drop in a blender and mix until mixed well. 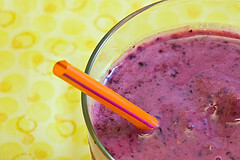 You can substitute frozen blueberries to give it more of a slushy feel. This entry was posted on Friday, June 26th, 2009 at 7:49 am	and is filed under Food. You can follow any responses to this entry through the RSS 2.0 feed. You can leave a response, or trackback from your own site.